Inground Pool Safety Net – Will My Child Get Wet? Will My Child Get Wet? The honest answer to this common question is – possibly. An inground pool safety net’s tension is greater at the edge of the pool. It is here at the perimeter edge of the cover that a crawler is typically suspended above the water and their movement is slowed by the large mesh squares of the netting material. Katchakid’s unique mesh size has a dual action: small enough to prevent a baby’s head from penetrating the net while simultaneously large enough to discourage movement. The crawlers limited gross motor skills should prevent the baby from getting too far onto the pool net where the net’s tension is deflected. A pool net prevents a more mobile child from unauthorized access to swimming. If a child of this age were to fall or climb on the net, they would probably get wet. 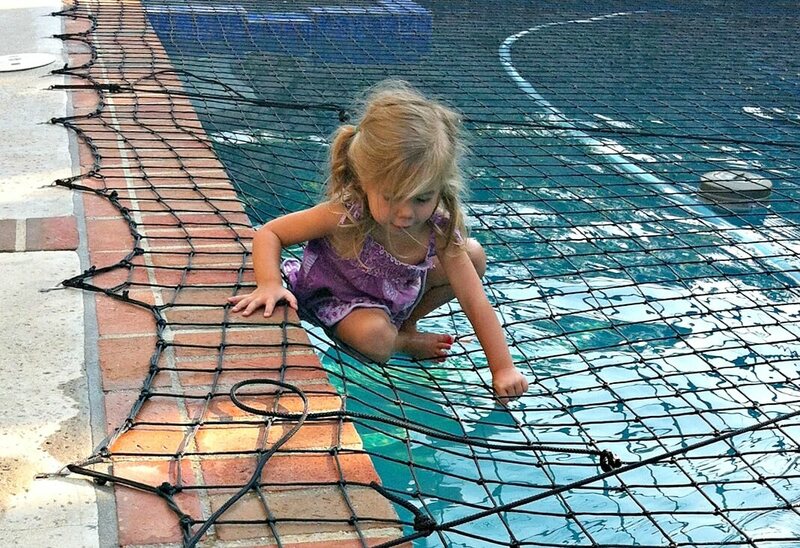 A younger child would not be suspended above the water but if the child can climb on the net – then they should be able to climb off the net using the inground pool safety net as a tool and guide to get back to the safety of the deck. An inground pool safety net is one of many recommended pool barriers to secure swimming pools. Pool safety experts recommend multiple barriers around a swimming pool of which a pool safety net is just one. The Katchakid pool net serves as a barrier between the child and the water; the net must be in good condition, properly positioned and tensioned to support the weight of a young child near the pool’s edge. Always monitor your pools water level for maximum necessary clearance between the water surface and the net – especially after rain. Katchakid Pool Safety Barriers are supplementary pool safety aids and not a substitute for the undivided and competent supervision of an adult. A Katchakid pool safety barrier can never replace adult supervision, nor can it be a guarantee against drowning or other accidents. Always use your barrier. Avoid Drowning Risk – Never Leave Children Unattended Near Water. Read Our Katchakid Code on how to make your pool a safer place.